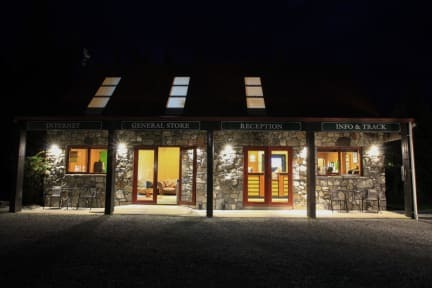 Oscar and the team are here to look after your needs as well as offering FREE 24 hour in room WIFI, FREE tea & coffee, FREE use of the biggest hot tub in NZ, FREE Scandinavian Sauna, FREE HUGS, FREE GHD hair straighteners and hairdryers in the nicest backpackers bathrooms anywhere. Nightly prizes in the bar for the biggest activities in Queenstown. $5 discount on our all you can eat pizza fest deal with a FREE beer for guests. FREE torches for glow-worm spotting $4 upgrades to en-suite flash-packer dorm rooms. FREE advice and lots of smiley happy people here to make sure you have a brilliant time. Deep In the heart of West Coast Glacier country, Rainforest Retreat is a great find, with a range of accommodation set amongst lush native bush in Franz Josef township. Enjoy privacy and sanctuary in secluded cottages and tree huts, relax in the spas and sauna, dine out and have fun at the bar/restaurant, or just relish the bush setting and cook up barbecues with new friends. For dorm accommodation choose from our funky En-suite 4 Bed Flash-packer dorms, and 4 to 8 bed shared dorms. we have accommodation to suit every need and budget. 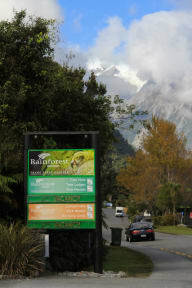 Rainforest Backpackers was architecturally designed and landscaped to merge into the existing rainforest environment whilst maximising the awesome alpine and glacier views. Park sites are also on site for campers and vans. The Onsite Monsoon bar and restaurant will quite probably be your favourite bar in NZ, with roaring fires, regular DJ's, nightly prizes and giveaways for all your favourite activities. The Monsoon restaurant will satisfy your hunger whatever your budget with all you can eat pizza nights, backpacker meal deals and a specially created a la carte menu specially designed by our head chef Ronald Lacanilao, who has created a menu of mouth-watering delicacies to treat you after a hard day glacier exploring. Acabei não ficando muito tempo no hostel mas aparentemente estava bem limpo e organizado. Tive a sorte de ter o quarto só para min apesar das camas de baixo não estarem arrumadas o que me fez pensar que tinha mais duas pessoas no quarto. Fora isso a noite que passei lá foi ótima. O quarto é bem pequeno, mas aconchegante. Não gostamos muito do banheiro ser compartilhado para banho e uso do toillet por homens e mulheres. Fora isso, muito bem localizado e com estrutura grande e muito boa.